As an instructor of Media Communications at the School of Visual Arts in New York City, Joey Skaggs taught communications methodology to art students. He covered advertising, public relations, commercial art, and audio/video production. He also taught storytelling as an essential tool in capturing attention and getting information to an audience. One of his particular interests was teaching students to be aware of the impact the media had on them and to become more skeptical media consumers, in other words, media literacy. He also wanted them to have the tools necessary to communicate their ideas to a broad audience. To enliven his students’ experience, he created projects that took them out of the classroom and into the streets. These early classes laid the groundwork for his later course in Culture Jamming and Media Activism, the first of its kind anywhere. With his class in 1977, Skaggs taught his students how to create a controversy. They decided to bring to life the long time urban legend of New York City’s sewer monster. To create the opportunity, they planned a protest in front of the New York Governor’s midtown office. At the time, New York residents were concerned about the potential disruption from the Concorde jet, which was to begin flying in and out of New York. The Concorde was a supersonic airplane that could travel at speeds up to Mach 2.2 (more than twice the speed of sound) or 1,450 miles per hour. Because of it’s sonic boom, it was a quite possibly the loudest, commercial airplane ever created. Piggybacking on this socially charged issue, one student played the Sewer Monster, in a costume and prosthetics designed by another student, Screaming Mad George, who would go on to a career in special visual effects and film directing. 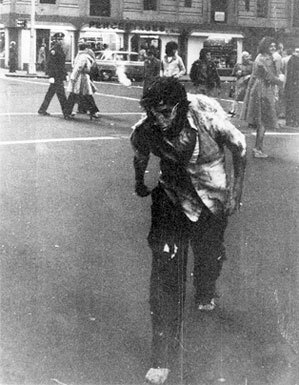 Appearing, presumably from a manhole in the street, the monster ran at and attacked the protestors. They dropped their protest signs and ran away screaming “It’s the sewer monster, it’s the sewer monster!”, leaving pedestrians equally shocked. For the students, this was their first experience participating in street theater in which the performers interact with an unsuspecting public.